See our calendar and Facebook page for updates and details as we have them. Looking for a powerful and exhilarating addition to your event? Contact us for details on booking! Give your loved one something to remember! Contact us to order your gift certificate or to ask questions. Classes typically consist of 8-10 Lessons for $120-150 ($15/lesson), or 2 payments of $60-75. Drumming equipment is provided, including taiko drums, bachi (drum sticks), and dai (stands). Bring your own ear plugs & water, and wear comfortable clothing and shoes. Wadaiko, Japanese style drumming, has been described as dynamic, thunderous, and powerful; the sound can be felt in your soul. Kokyo Taiko, based in Lincoln, brings this exciting art of choreographed drumming to communities throughout Nebraska and surrounding states. With the sound of the drums resonating in the soul of both performer and listener, Kokyo's members savor this connection to their beloved Japanese culture and feel proud to share this amazing tradition with their audiences. Having played with a community based wadaiko group in Japan, Kokyo's leader, Maureen Brase-Houchin, wanted to continue this wonderful combination of exercise and music after returning to America. She began by teaching taiko to Japanese exchange students and American students studying Japanese language. Those first few years involved short term practices in order to perform at annual events celebrating Japanese culture. Longing for permanence and encouraged by her dedicated taiko students, Maureen formed Kokyo Taiko in 2004. Tim Jensen, one of her first students, and Deb Helzer, who also played in a community taiko group in Japan, helped give depth to Kokyo with their experience. Ironically, the Kokyo members who are from Japan (now Lincoln residents), did not play taiko in Japan. 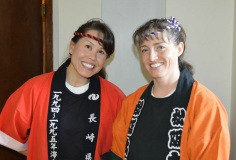 Their introduction to taiko came in Nebraska, from an American (albeit half-Japanese!). The opportunity to learn wadaiko so far away from home has been especially rewarding for those members.